If you want to keep it looking clean and fresh, you need to circulate its water. Otherwise, if the water is stagnant and lacks oxygen, your fish or plants have fewer chances to thrive. Fortunately, the best pond pumps on the market have a good water flow so they can revitalise your pond in no time. And if you’re not sure how to choose one, read the buying guide at the end of these reviews. First, let’s forage the market and find the perfect pond pump for your needs. This pond pump from Pontec is one of the best choices for running filters and watercourses because it’s extremely efficient. This particular model can filter up to 8000 litres/ hour, but there are more powerful versions on the product page that can filter up to 17000 litres/hour. All this work is done with low running costs, considering that the power pump needs just a 70-watt power consumption. Another advantage is that it can handle solids up to 8 mm, so it’s not just for clear waters. And if something goes wrong with it, you can always rely on the 3-year warranty. Design-wise, the Pontec PondoMax has some user-friendly features, like its stepped hose tail that makes it easy to use with various hose diameters: 25 mm, 32 mm and 38 mm. The mains cable is considerably generous, at 10 m, and the thermal cut-off will protect the pump from overheating. But there are some design flaws too, like the strainer cage that always seems to clog, requiring constant cleaning. That’s why the lid would definitely need a handle to pick it out from the water. Or better yet, a bottom support to keep the sludge from getting in. The good news is that, with such a good value for money pump, you can easily improvise an affordable support and handle at home. The AquaECO pump from All Pond Solutions is one of the best on the market for your garden’s small pond. Its characteristics set it apart from its competitors, starting with an efficient rate of filtering water, at 6000 litres/hour, with a power consumption of just 40W. There are other versions on the product page, though, that have different filtration rates between 3000 to 12000 litres/ hour, so you can find the right model for your needs. The max head is 4.2 meters, and the hose tail connector can fit hoses with 25mm, 32 mm or 38 mm diameters. This pump has a 10-metre long power cable that can accommodate various needs and can constantly pump dirty water thanks to its anti-clogging design. The impeller is high-quality and the ceramic shaft is resistant, decreasing blockage risks. On the other hand, ceramic is prone to cracks and can’t withstand heat so well, but you can always use your 2-year warranty to fix it. Besides, what the Pontec pump lacks, this one has: the much-needed lid handle for easy recovery or setup. The low noise and low running costs are important advantages too. This solar pump from Tidal is one of the best koi pond pumps on the market, courtesy of a reliable construction and quality craftsmanship. This pump has an integrated 5-watt solar panel that’s considerably powerful, working at 9 volts DC. You even have the 7.4 V 2000 mAh battery included in the package, that allows the pump to work when it’s cloudy or at night. It can’t work 24/7, though: if it has been fully charged in direct sunlight, it can work for up to 6 hours. Unfortunately, that means you need to restart the pump on a daily basis. The cable is about 5 metres long and the maximum water lift is just 1.4 metres, which makes this pump better suited for smaller ponds and garden fountains. Besides, the water flow is lower than the two products reviewed above, at 400 litres/hour. The built-in ground spike makes setting it up very easy, but remember to place it in a sunny spot. Otherwise, this pump could definitely use longer leads so you can place it somewhere with plenty of peripheral shade. This Blagdon pump may be the best garden pond pump for people who are looking for a 2in1 solution. That’s because this product goes big, offering a 5in1 solution to revitalise your pond. Remember that this pump is better suited for small and medium ponds, up to 6000 litres, but there are other versions on the main product page, from 2000 to 9000-litre ponds. The first advantage is that it features a low-voltage pump and filter system, though it doesn’t have a huge flow rate when compared to its competitors. The maximum flow rate is 1500 litres/hour at the surface but decreases to 200 litres/hour at 1.5 metres. The four included fountain heads, Bell Jet, Tulip Jet, Daisy Jet and Triple Jet, look really interesting, but it can get blocked pretty easily. 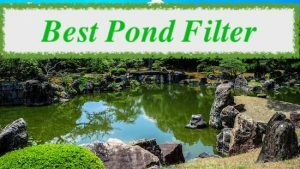 Basically, this is a great solution for someone that doesn’t want to spend some extra money on purchasing a separate pond filter. However, its top advantage is actually the quality construction. There is a mechanical and biological filter, a UV clarifier, as well as a polymer wool cartridge and a silent functioning. Design wise, the night LED spotlight looks good too. The cable is fairly long, reaching 10 metres, plus there are two extension pipes and three hose fittings, for 12.5 mm, 18.75 mm and 25 mm hose diameters. This Minipond Pump manufactured by Blagdon is a great choice for koi ponds or small fountains. It filters 700 litres/hour, though there are other options on the main product page that can filter up to 2000 litres/hour. Either way, this pump is one of the most affordable on the market, with a powerful single-moving part impeller system. There are various advantages when it comes to this pump’s construction. The pre-filter cage keeps this pump clean and easy maintenance, but it can’t perform well in a pond with fish. Otherwise, you might need to take the filter out and clean it daily. The ceramic shaft is wear-resistant, but it can easily crack if you don’t handle it with care. Even the 10 Watts power consumption is very low, but remember that the max pumping height is just 1.25 metres. There are various fittings available with this pump, which show user-friendliness. There’s a hose adaptor that fits different hose diameters, a flow-control valve and three attractive-looking fountain heads. 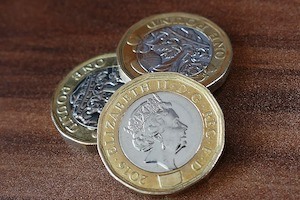 The 3-year guarantee is another definite point in its favour. Submersible pond pumps have an electric motor that activates an impeller. When it turns, water gets in from one side and out from the other. Basically, what this means is that the water flow is influenced by the motor’s power and by how big the impeller is. Big impellers and strong motors can pump more water, but this also adds to the overall electricity cost. The first thing you need to know is how big your pond is, which means you have to figure out the volume. Next, you should know that the rule of thumb is that the water should circulate at least once every couple of hours. That means the litres per hour rating should be at least half of your pond’s volume. For instance, a 6000-litre pond needs a 3000 litres/hour pump. However, take into account that fish ponds, fountains and waterfalls need a larger pump. The general rule for fish ponds is that the pump needs to work on double capacity. So for the 6000-litre pond with fish, you need a 6000 litre/hour pump. It’s a bit more difficult to calculate this for waterfalls, but begin at getting an estimate for its height. That means you will need to add another metre of height for every 10 metres of hosing you need. Besides, for each centimetre of width of the waterfall, you will need an additional 150 litres/hour. As such, for a 25-cm wide stream, your pump should have an approximately 3700 litre per hour excess flow at the waterfall’s height. 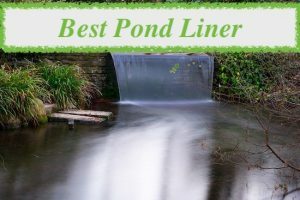 How long do Pond Pumps Work? Short answer: Most pond pumps come with a 2 to 3-year guarantee, and not a lot of them can live long after. Long answer: Pumps require regular maintenance, and you should always perform an annual servicing. A submersible pump needs more maintenance than an external one, though. You should also store the pump in a cool, dry and ventilated place. The filter chambers need to be clean so the pump doesn’t overwork. This means that pumps last longer in clean water, with less wear-and-tear chances. Conversely, fish ponds and waterfalls or streams decrease the life of your pump. Submersible pumps always meet their doom because of debris and limescale in the water, so their life is limited to a couple of years. However, they might live even less if placed in hard water, in which case you need a descaling method. Just make sure the water softener you choose doesn’t hurt the fish. The materials used for the pump’s construction relate to how long it lasts too. As such, ceramic shafts are perfect for wear-and-tear caused by water. The running costs can be calculated by multiplying the charge per unit with the pump’s power rating, to find out the hourly cost. Let’s take an example: how much would it cost to keep a 70-watt pump running for 24 hours, at an average unit cost of 12 pence? You multiply 0.07kW by 12p to find out the cost per hour, then you multiply by 24 to find out the daily cost, which is 20.16p. This number should give you an approximate idea of how much it would cost you to run a pond pump 24/7. What are the Included Extras? Some pumps come with a variety of included extras, but the most common is the cable. A good cable length is about 10 metres, so your pump has a good reach from your power charger. A stepped hose tail and various connectors is another great addition. While some pump models can offer different hose tail connectors for smaller hoses, some cater to bigger hoses – so make sure you find out if these connectors actually go well with your hose. A thermal cut-off is another great thing to have, protecting your pump from overheating when it’s dry-running. Design-wise, it’s another advantage if your pump has a lid handle, so you can manoeuvre it without any issues. What Extra Features Do I Need? If you want to save more energy while pumping water, you can always consider a solar pump. The pump charges its battery from the sun, and the battery can work even when it’s cloudy or dark outside. Other pumps come with an included filtration system, which is an advantage if your water is particularly dirty – for example, you have a fish pond. There are other design features you might like, such as a variety of fountain heads to make your fountain look more attractive, a UV clarifier or LED spotlights for when it’s dark. 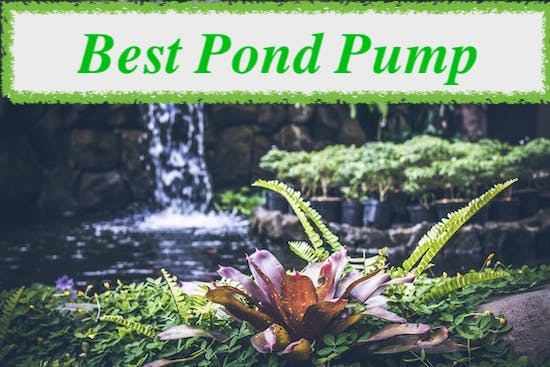 You’ve reached the end of a series of garden pond pump reviews, each best suited for a different purpose. There are various models on the market, for differently shaped and sized ponds, for waterfalls, fountains and koi ponds. It depends on you to follow the buying guide above and choose according to your needs. Only then will you be able to say that you have a truly perfect pond pump. That being said, what pond pumps have you tried before? What worked and what didn’t?